The Cinque Terre is the star attraction of the Italian Riviera, but exploring the UNESCO-listed landscapes by car can be tricky. 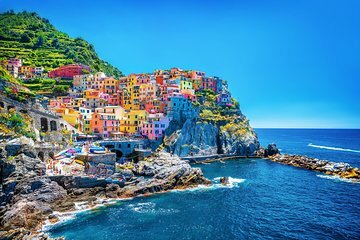 Instead, maximize your time on this private full-day tour by train from La Spezia and visit all of the five Cinque Terre villages in one day. 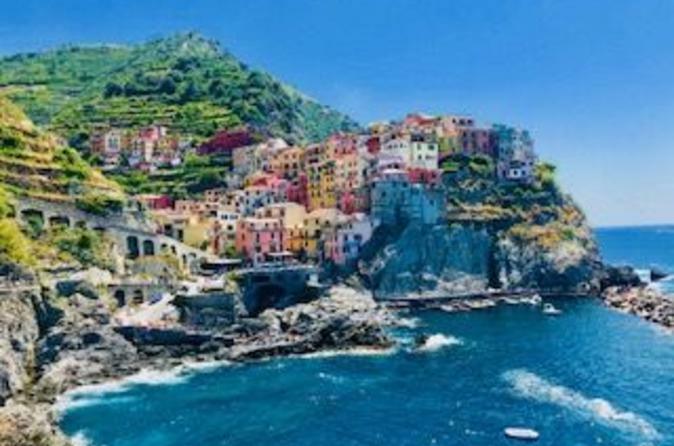 If you want to see the main highlights of all the 5 Villages of the Cinque Terre in one day with a local guide who knows the terrain well, positively opt for this tour. During our time at La Spezia, we experienced the Cinque Terre by sea, road and train and found out that each mode of travel has its own charm and gives you a different perspective of the region. There is a special train that runs from La Spezia to the Cinque Terre which gives visitors the opportunity to access the towns very conveniently. Basically the train traverses 4 of the Cinque Terre more or less in the middle so access to all directions of the towns becomes relatively easier. It's only the town of Corniglia which is a little tricky because it's located on top of a cliff, so either you have to walk up hundreds of steps from the Railway Station to it if you can manage, it's a nice experience and the vistas you see en route are great or there's a small round trip shuttle bus to Corniglia from the Station. Our Tour was brilliantly conducted by experienced local guide Laura. She organised the day for us in a way where we could do the most within the timeframe that we had. We learnt of the history of the Cinque Terre and of each individual town, we were shown the best that each town had to offer in terms of sights, views, architecture, monuments, unusual aspects, unique produce, souvenirs, etc. We had time to take a lot of photographs, sample local food, pick up souvenirs, etc. Walking was at our own pace and Laura very enthusiastically answered all our questions. Lunch was at a popular restaurant which Laura recommended in Vernazza, one of the Cinque Terre's most photographed towns. When eating in the Cinque Terre I recommed trying the local anchovies. mussels and wine sourced from the multitude of Cinque Terre's vineyards. With Laura helping us order, every dish was delicious! Travelling by train, though it's very busy during tourist season, offers scenic views and convenience as the trains run with much frequency. I recommend leaving as early as possible for this Tour as there's much to do and also it's a way to avoid crowds that come in much later. This Tour offers a lot and the guides at Faberest as so knowledgable, that they try to ensure that you travel back to La Spezia satisfied that you've managed to experience the best of the Cinque Terre in a day. Donatella fue una guía excelente , tomamos el Tour en español, afortunadamente llegamos un día antes a Genova y el tour empezaba en La Spezia, pero ella salía de Genova también, nos comunicamos y fue muy amable en explicarnos que boleto comprar de tren para la Spezia y al día siguiente que era el tour pasó a nuestro hotel que estaba frente a la terminal y nos acompañó a la terminal y hasta nuestro asiento, conocimos 3 de los cinco pueblitos, no pudimos ver los pueblitos desde el mar porque había viento y el oleaje no permitió que los barquitos salieran, esto era algo que yo esperaba con ilusión, pero no se pudo. Recorrimos los puebltos y nos sugirió donde comer, la comida esutvo muy buena y al final nos explicó muy bien cómo regresar ya que decidimos quedarnos en el último pueblito Monterosso, fue un día muy bien aprovechado, gracias Donatella! Bill met us on time at the La Spezia train station and we headed out to CT immediately. He helped us navigate the trains, and showed us many beautiful sites and panoramas of the area. We could ask him questions about the area, and traditions, and he patiently answered everything. He also directed us on where to buy traditional foods and wines of the area, as well as other items. He tailored the tour to our needs not a set plan, and started in the second village of CT rather than the first to avoid the crowds.